"Most superhero stories start with a meteor shower or a nasty insect bite, but mine actually starts with a kiss . . . "
An accident that should end in tragedy instead gives seventeen-year-old Jamie Baker a slew of uncontrollable superhuman abilitites. To keep her secret safe Jamie socially exiles herself, earning the title of Rocklin High's resident ice queen. But during a supercharged encounter with star quarterback Ryan Miller she literally kisses anonymity goodbye. Now the annoyingly irrestible Ryan will stop at nothing to melt the heart of the ice queen and find out what makes her so special. Unfortunately, Ryan is not the only person on to her secret. Will Jamie learn to control her unstable powers before being discovered by the media or turned into a government lab rat? Check out this "super" cute trailer! I had my doubts about this book, as I do for any book with an all-pink cover. However, Being Jamie Baker totally blew me away. On the outside, Jamie is a surly character with a typical devil-may-care attitude. Inside, though, Jamie is a young woman scared for her life if anyone finds out just how different she really is. All she wants is to get her old, pre-accident life back, but she knows that letting anyone in will make it that much harder to move on again if something should happen. It really just makes you want to reach into the book and hug her, even when she cops an attitude just to keep people at arm's length. Ryan is really just as irrestible as the back cover blurb says. Every high school has that one guy that everyone loves and wants to either be friends with or date him - that's Ryan in a nutshell. He certainly isn't perfect, but he goes above and beyond to try to get Jamie to open up. The scenes in which Jamie and Ryan argue back and forth were probably among my favorites, especially the very last one. (Super cute!) There are a few cliches that are difficult to avoid in the superhero genre, and that's the only reason why this is rated four stars instead of five. However, Oram does a great job of making Jamie feel like a real person instead of a cliched superhero, and that's why you should read this book. 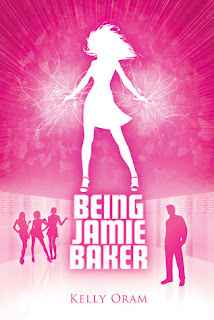 Being Jamie Baker is Kelly Oram's debut novel.